I've created some kind of a ManiaDrive Mustang Edition. You're able to drive a customized Ford Mustang inside ManiaDrive, which is my favorite muscle car from the United States of America. 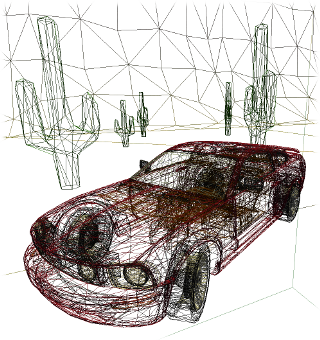 The following package includes all resources with the Blender and GIMP files, which I've used to create the car. It also contains a modified version of ManiaDrive R890 and the related diff file, which can be used to patch further versions of ManiaDrive, because it includes the different contents of the two files, so you can easily see what differs from the original to the modified ManiaDrive version. The car is shipped with the exterior color performance white and the interior is equipped with brown leather by default. But I've made it simple to change this values, perhaps you want a totally black Mustang. To change the equipment of your car, you can modify the exterior and interior files, they already include original manufacturer and favorite color sets of mine. Put the desired color to the big outlined box on the top. You are also able to change the aluminum rims, the tires, you can even tune and pimp your car with extras modifying the meshes. All in all the set up is not perfect for sure, but I was able to drive the default tracks. It's a bit tricky to handle the car. Feel free to use and abuse the files as you like. You seems to be a big fan of the "Pony" ! What is really amazing is how the few changes you've done to the physics impacts completely the feeling of the car. In facts, I think that the idea of driving a way "stronger" car than the Clio already change the way you feel the car. A nice body style, alloy wheels and two pipes ... and you already think you're going way faster ! You've done the entire mesh by yourself ? It's a very impressive job. A few textures and shaders, and we ends up with the best looking car ever for Raydium ! I'm already thinking about to create the new 2010 Mustang, which was released in the spring of 2009 and looks slightly better to me. But I haven't found a valid blueprint for it yet, not only the badge was changed. How do you have done the environment texture calculation on the Fiesta? It looks very good, like metallic color painting. Perhaps we could add this effect to the Mustang, too. I also want to add an option to put the lights on and off, so we'll see the main front and back lights. Perhaps It's also possible to drive in the dark, where you can only see a little bit of the track in front of the car and some places with street lamps, so you must have good knowledges of the tracks. Watch out, just dreaming! A back-up light and a light for the brakes is also interesting, but not really needed for me, because I never use the brakes. For all these ideas I really like to have a basic lens flare system added to the engine, which is already finished by Vicente I think, I'll talk to him about the latest version available, perhaps I'll try to continue working on it in the future, so we can add this to the list of features. Talking about the future, I'm very interested in ManiaDrive 2. Just watched the video again. Is there any kind of a preview version available? Are you currently working on the game and are you the only person working on it? I would really love to become a member of the project and do some volunteer work for it. Perhaps there is a task where I'm able to help. About ManiaDrive 2, I'm currently writing all car mechanics and physics systems. I want something way more realistic than MD1.x. For now, I've implemented Pacejka tire model (more or less the state of the art for this topic) and I'm currently writing a realistic engine for cars (torque curve, inertia), with realistic sounds (seamless multi-sample mixing), clutch and gearbox. The next planned feature is anti roll bars, and I've many many other things on the TODO with no time to write it now. To make it simple: for the car itself, ManiaCrash will be waaay more complex than its predecessor. And the idea is not to create a boring pseudo-simulation (GT5 ? ;) but a game a step beyond MD1.x: more crashes, more challenges, and many gameplay modes. But, shhh, I've already said too much. I'm not very proud with texture, but if you explain what modification (and why) you do to .tri i can try to adapt blender .tri export script. But you have to be very pedagogic it's a part i don't master at all. 1. Download and unzip the ZIP archive I've posted on top of this thread. 3.1 Replace all instances of "mustang_exterior.tga" with "mustang_exterior.tga#ENV_map.tga" in the mustang.tri file. 4.1 Replace all instances of "mustang_glass.tga" with "mustang_glass.tga#ENV_map.tga" in the mustang.tri file. 5. Give all related triangles, which are chrome and aluminum, from the car mustang.tri and wheel mustang_wheel.tri meshes a nice looking environment mapping texture. Some related parts are the front and back badge of the car and the aluminium rims to give an example. 5.1 Here is the problem, because you don't know which triangles are the ones matching the chrome and aluminum parts and you cannot replace all instances of the mustang.tga in mustang.tri and all instances of mustang_wheel.tga in mustang_wheel.tri, because they include other parts not going to have an environment mapping texture. Perhaps you want to try it yourself, you will probably understand the problem much better. I must correct myself: I've found out that this is not the easiest way, because you need at least an extra texture for the transparent looking glass texture. The glass texture has to stay for its own, with or without environment mapping texture added, because otherwise every related triangles using this texture including transparency will look transparent for some reason. I've quickly viewed both Raydium TRI export scripts, each of them seems to be able to export multi-textured meshes in general, looking at cocorobix.tri for example, but it seems not possible to me to export the mesh with only some previous defined multi-textured triangles, but perhaps I'm completely wrong and you are gladly invited to correct me. My wish is to have a possibility to select the related triangles inside Blender and assign the environment texture to them as an additional texture, so we can use one texture for all meshes and don't have to split every part into several textures, except the transparent and environment ones indeed. Please report if something is not clear, I'd understand it. Export script has been updated (rev 891). Add an uv layer to your mesh and give a name beginning with "#" caracter and whatever you want/need after (for instance #ENV_map.tga). This will be exported to specific faces where assigned. Can you test this please and report bug/problems. Rev 892 you can specify face by face environement mapping. If a #ENV_map uv texture channel is assigned to an image (no importance about the image) the face will be environement mapped, else it will be a normal one. Perhaps there is a flag in blender to specify this ? I tested a lot including different combinations of settings. I was able to export with the #ENV_map.tga texture appended only adding an extra UV layer, but the output was for the whole mesh, so every line had the #ENV_map.tga added. Specifying only some triangles with the environment mapping was not able, because of an error in the script [Check console message ...], sorry haven't got the output any more and can't reproduce this behavior. I wasn't able to export with the #ENV_Map.tga texture at all. Neither adding only an extra UV layer. Nor specifying only some triangles. Haven't got any error message, so the script runs correctly visually. I haven't figured out how to set the environment mapping properly. It simply doesn't work for me. Which is the correct way to get this working? Perhaps you could offer a small example, e. g. a Blender file showing a simple textured cube using only one texture file and the provisorily #ENV_map.tga texture of course, where one side of the cube has an environment mapping. This would be very helpful for me to understand what settings have to be made to get this working. Ok here is my blend test file , it's a concept car, based on secret photo so please don't take screenshoot or diffuse it ! I give the .tri file generated by the export script. Add UVTexture layer , name it #ENV_map.tga. Go in face select mode. Normally your face is not Mapped to an image. 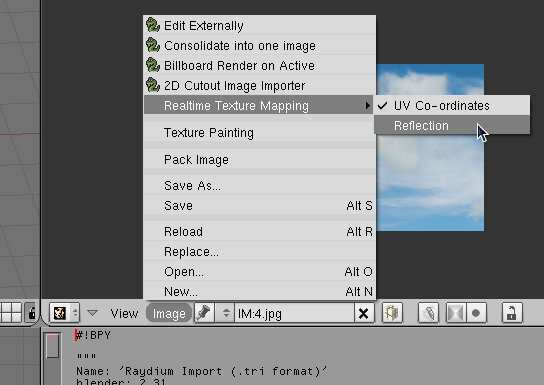 Select an image to UV with if you want environnement map or live it blank. export and normally it does the trick. If it's not clear report it ! Impressive car ! But I was unable to locate where to put the ignition key ... ? PS: ouille, are you becoming sort of a Python Master or something ? For the last modification of the script i've study blender python api extensivly. You know blender better than i, is there an option or something that correspond to environnement mapping ? To allow face env_mapping selection i can do the trick using face image affectation (as actually) or more simply reading the tex bit of face mode this bit can be found in the texture face panel of blender. What solution seem's better to you ? I had hard time to find the "tex bit" ... it's not as easy and straightforward to use than the uv layer option, IMHO. Your current idea seems OK to me, the only trouble I can see is that the user can be a bit confused by the "dummy texture" thing. It's not very easy to understand that the texture is only a "flag" for envmap, in other words. Perhaps another option would be to name the uv layer with just "#" character, and let the user chose his envmap texture for desired faces ? It's also allowing to use different environment map textures on the same layer. Ohhh yeah! Thank you very much, this works great and is exactly the option I wanted! Merci! I was blind, the UV layer was not set active, damn! I'll add some things like a licence plate and upload an updated version soon. Xfennec's idea with just the "#" character is very interesting indeed.